First evening climb. It takes over an hour to reach The Foundry due to ‘police incident’ but Clare is undaunted. 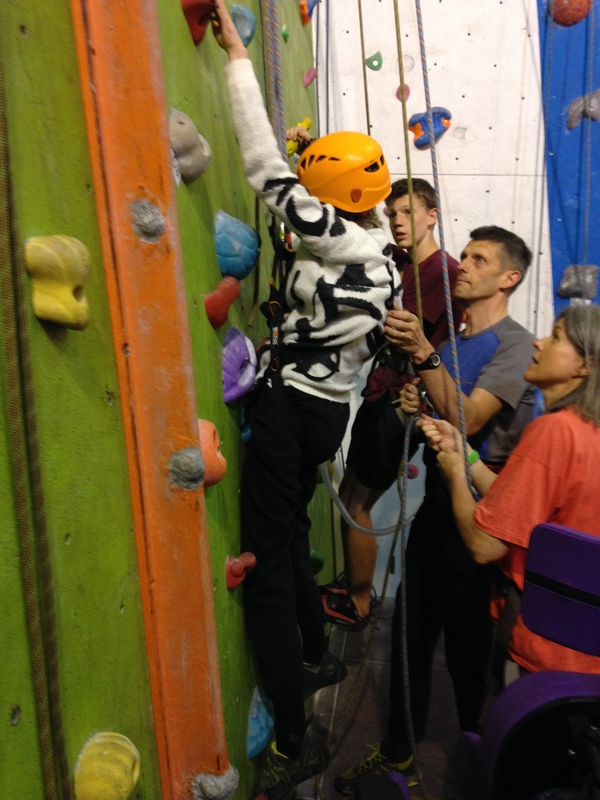 I’d been wondering if she would still be psyched up for climbing after putting in lots of effort at school. Apparently so. nick.whittaker@rotherham.gov.uk to sponsor him.) 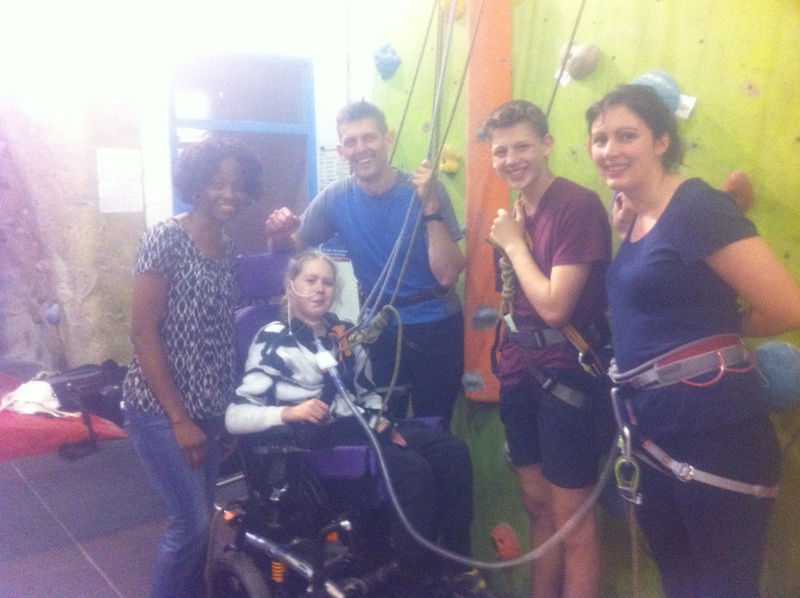 So proud to be part of efforts to let other disabled youngsters go climbing. It’s straight to business when we finally arrive at the wall (though we do ask Helen how her mum’s wedding went). “How do you feel?” asks Nick. Clare waves a horizontal hand: “So-so”. The vent is silent on the back of the chair and Clare has managed without it most of the day, but I turn it on and connect it. No point in getting any tireder than you have to. Clare tries on Hazel’s climbing shoes. Robin and Nick assure us that Hazel won’t notice absence of these shoes or she doesn’t mind or there’s lots of stuff in the house anyway. The shoes are a bit large but with awesomely sticky rubber soles they are going to be good. Nick has also brought the yellow helmet tried on last week. More foot pushing may lead to more risk of head swinging into wall. Robin is on the other side to usual (to Clare’s right – though he points out that he has climbed on this side before). For some reason there needs to be some ducking and weaving around the ropes, and high-stepping or limbo-ing over/under the vent-tubing. Robin is also a bit further over today, his and Clare’s paths separated by a vertical black ribbon. Liquorice, I call it. Robin and Helen are eyeing it up for climbing. Clare sets off. Pretty good start. The shoes certainly do help her feet stick to the wall. Clare seems more independent in placing her hands this week. She searches for hand holds, and inches upwards. Feet and legs get a bit of the action. Since her injury, Clare has found a tendency to tilt her head to the left, and when I see the tilt increasing I wonder if she is getting tired. Yup, time for a rest. In the rest Nick tells me to pull harder. 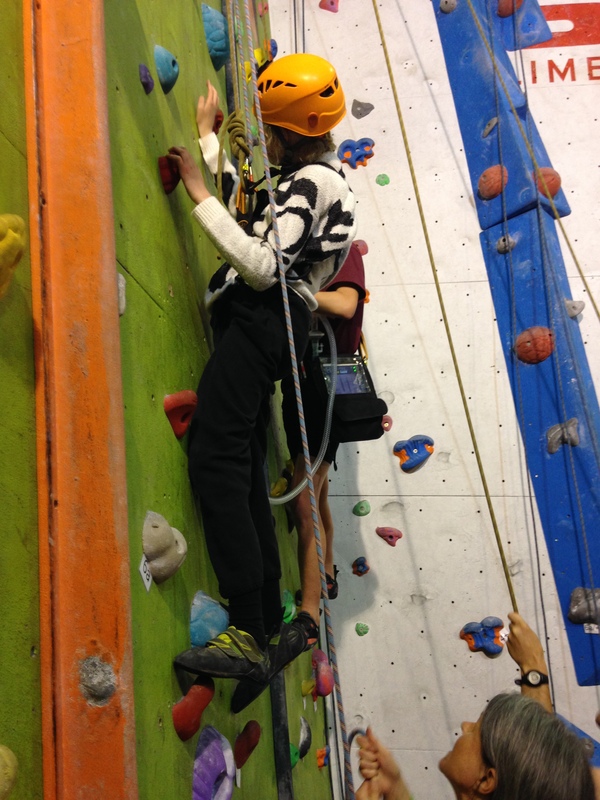 Then Clare can ascend faster, and find more holds. Robin and Helen deal with the liquorice. The question is whether it can be climbed to the top with hands and feet gripping nothing but this thin black strip. 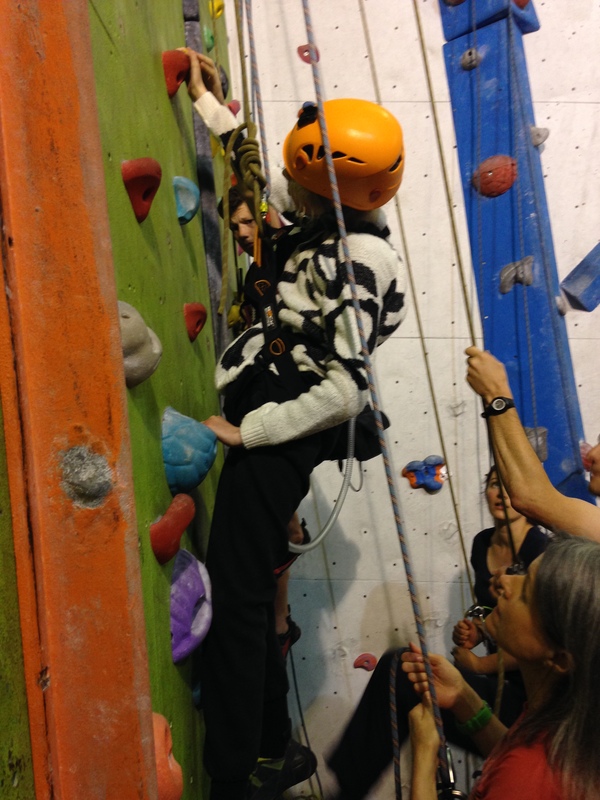 Robin sets off to find out, Helen belaying. While his dad is running, running and running at the moment, Robin’s thing is cycling. He is planning to cycle from Lands End to John o’ Groats. When he gets his new bike … he’s currently stripping down the old one (apparently a required skill before the new bike can be acquired). All of us saw something of Le Tour. Clare and I cheated a bit, but we do have selfies including cyclists zooming past Meadowhall (and we did better than Clare’s sisters, who stayed at home and watched Trollhunter). We ask the “Year 10’s” about their work experience experiences. Clare did her work experience in the school office, and enjoyed the change in environment for a week. Robin was at a Youth Hostel and he got involved in outdoor stuff as well other duties (no surprise there). Now it’s time for Clare’s next climb. 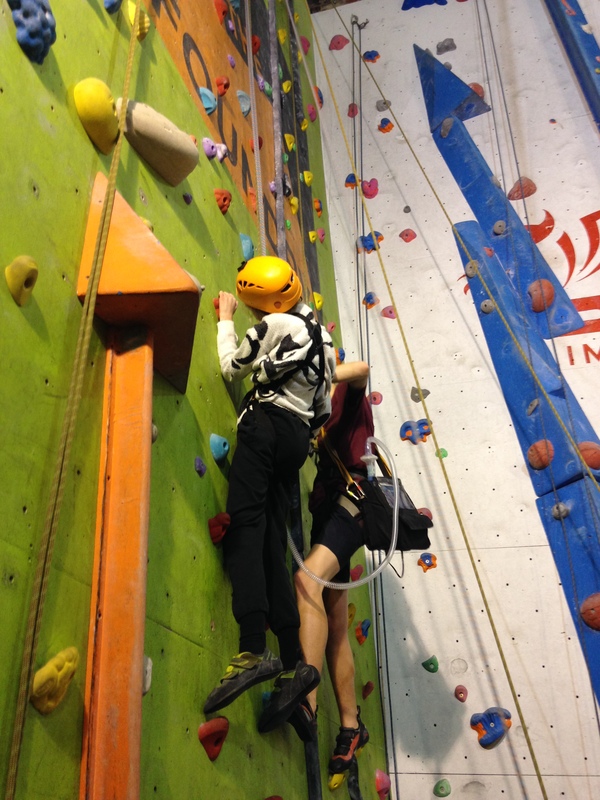 Nick thinks Clare’s strategy should be to hold her body out from wall a bit, and demonstrates. OK, give it a try. 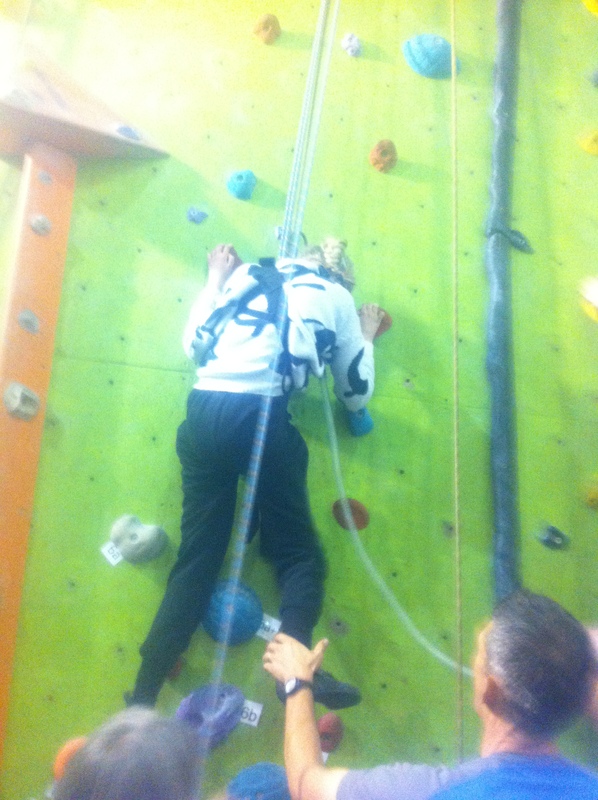 … 2 steps to wall … and a few moments of standing while we and our ropes and the vent tubing all change places. “Maypole dancing!” says Helen. The ropes end up untwisted. In Climb 2 Clare doesn’t really get her body out from the wall much, and she uses her feet less. But what I’m struck by is how amazing she looks with her body positioned on the wall. Her hands are doing well finding and staying on the holds. I’m pulling harder. I can’t really see how Clare is. But she still nods when asked if she is OK. Nick says we should get the helmet off. It isn’t really helping and it slips back on Clare’s head. Back in the chair. Group photos. Clare really pleased with the climb. We don’t have coffee today but there’s still time to chat. Robin says Nick is out all the time now … running. I ask Nick if his ankle has recovered enough to be coping with this. Nick says he seems to be fine running a lot of miles now, preparing as much as possible to tackle the 100 mountainous miles. 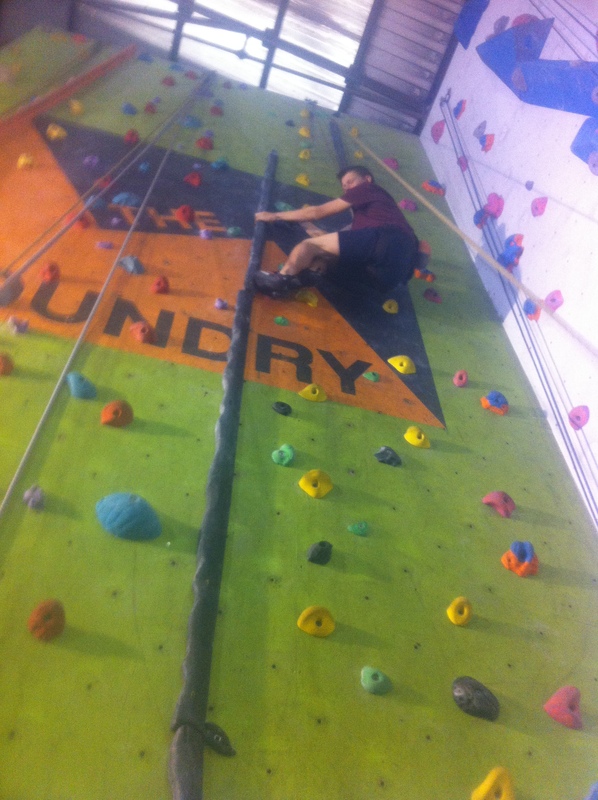 Nick also says he has been taking school kids climbing on Mondays. 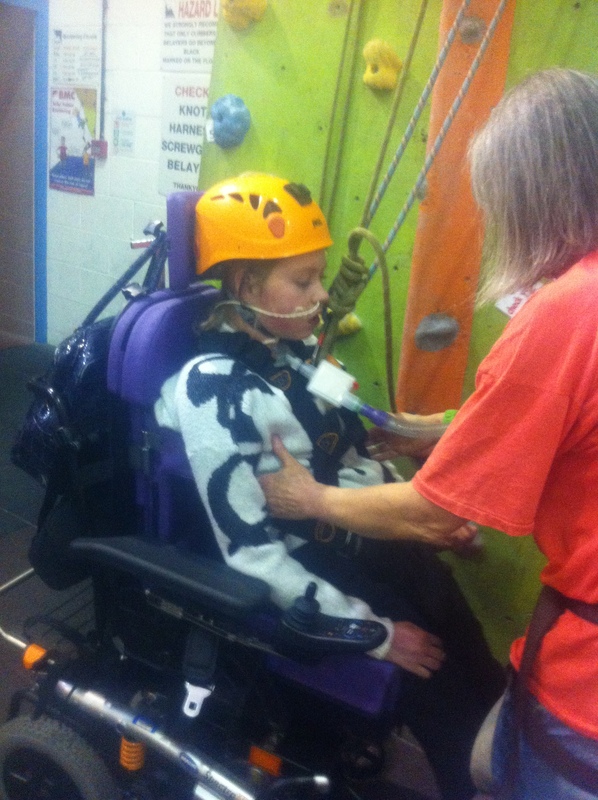 I feel extra happiness about how the whole climbing adventure is working out – it’s not just for Clare, but for everyone. 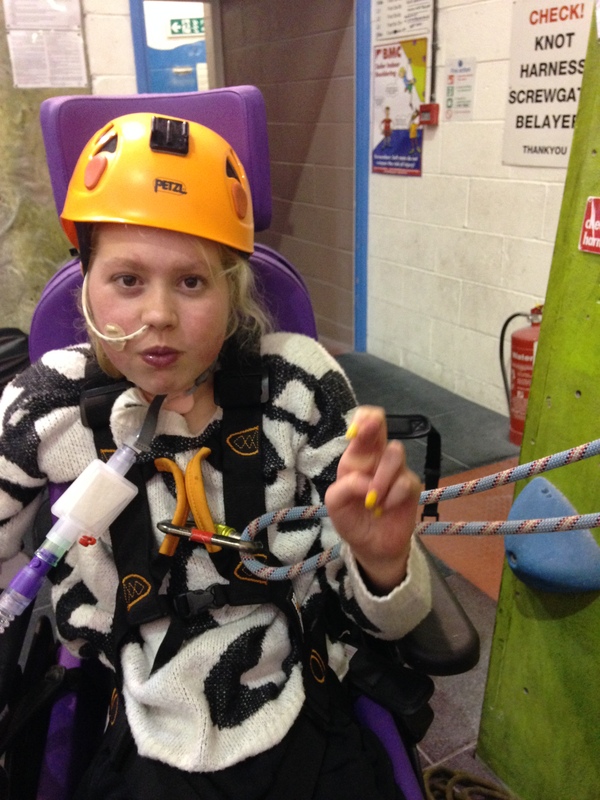 Nick’s fund raising will provide training as well as equipment to open up more possibilities for youngsters with disabilities to climb. 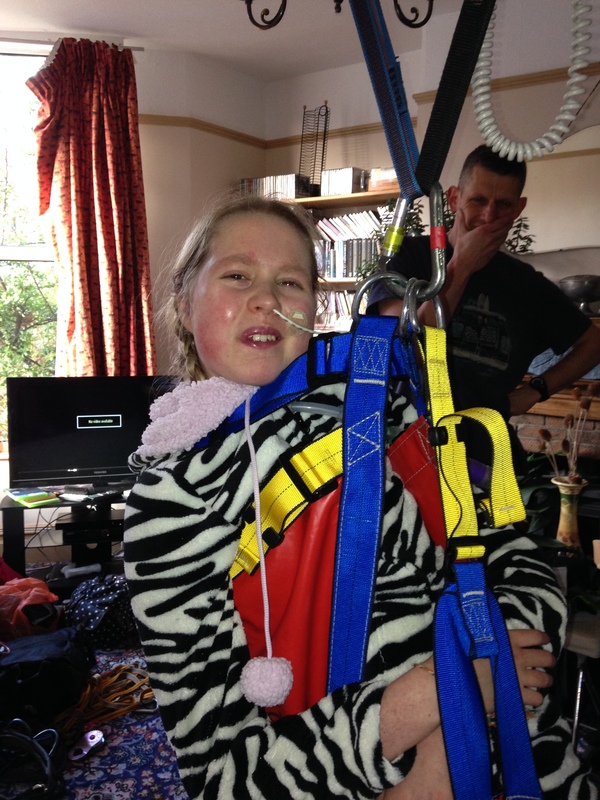 Here’s a picture of Clare from January, trying out a ‘rescue harness’ in our living room. This harness isn’t so different from a sling you might use for hoisting to and from wheelchair and bed, etc. … and it could be a climbing choice for people without “head control”. 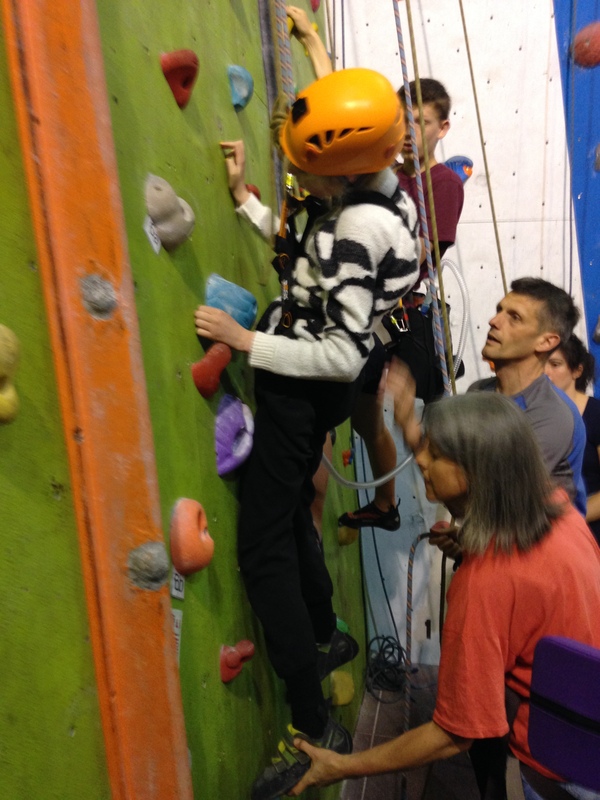 Hurray for climbing being the kind of sport where problems are solved, for all people and their different abilities and ambitions.